FPC@Western will house a 2500 tonne Compress Plus® hydraulic compression moulding press from Dieffenbacher, similar to that shown here. The FPC@Western is a collaboration between the Fraunhofer Institute for Chemical Technology (Fraunhofer ICT) of Germany and Canada's University of Western Ontario, located in London, Ontario. 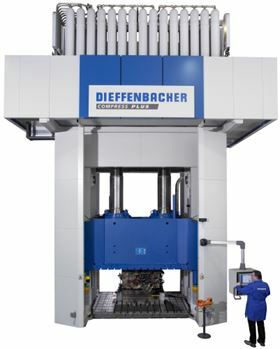 When the centre is fully operational in July 2012, the Dieffenbacher equipment will be used to mould long-fibre and direct-long-fibre thermoplastics (LFT, D-LFT) as well as for standard and direct-sheet moulding compound (SMC and D-SMC). The centre will also house equipment for high-pressure resin transfer moulding (HP-RTM). Ontario, FPC@Western’s home, is located in the heart of the Canadian automotive corridor, and is close to Detroit. The facility will be available to public and private clients globally, but the primary goal of the FPC@Western is to offer an independent research centre for customers throughout North America. “Western’s decision to equip the new FPC@Western centre with industrial-rather than research-scale equipment was done quite deliberately,” notes Christian Fais, manager-General Sales & Projects, Dieffenbacher North America. Krüss Scientific Instruments Inc has supplied its technology to Western Washington University.